In our technology-driven world, marketers need to be creative with their advertising strategies this holiday season. The retail landscape has evolved a great deal over the past few years with new mobile advances, but consumers are still making the majority of purchases in store, including 53 percent of tech savvy millennials. While online browsing patterns are valuable, they are not always the best indicator of purchase intent. The places consumers move about in the physical world tell a better story of consumer path to purchase. So, how can you leverage location data to hone in on your niche target audiences this holiday season? Follow the four tips below to ensure you reach the right consumers with the right message at the right moment. Don’t over complicate or overthink your targeting. Leverage simple insights to get a better understanding of your core audience and where they are likely to be shopping this holiday season. 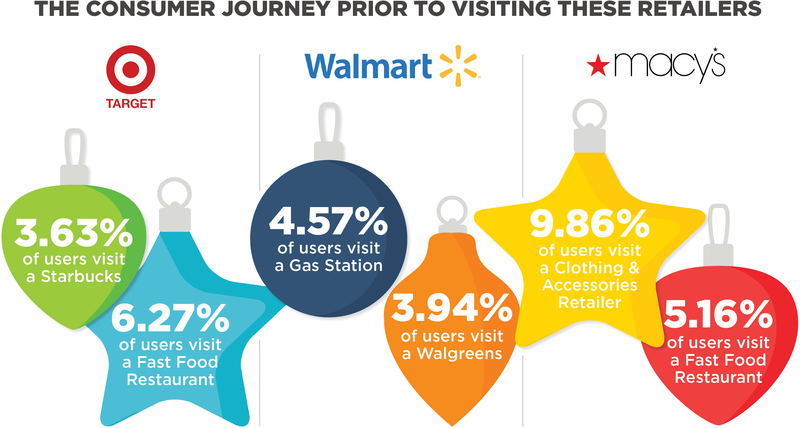 Below is a snapshot of chains and categories frequented by holiday shoppers. Don’t fall into the trap of purchasing the same audiences you’ve used all year long. Understand how your holiday audiences are moving about in the real world and then leverage those insights to build custom audiences that fit your campaign needs. A few examples of Factual’s custom audiences below. Location history is also a great way to target shoppers who have previously visited your store (and competitor stores). Factual can create custom audiences to reach your shoppers with the best deals this holiday season. Combine those custom audiences with category targeting to cover all the bases. For example, if you’re launching a new fitness product this year, you can target Factual’s gym goer, pilates & yoga studios, jogging trails, and health & vitamin stores audiences to expand your efforts. If you’re only considering online activity, you’ve got an incomplete picture of a customer’s journey. Look at where your target audience goes before and after their shopping trips to learn which retail or restaurant chains your shoppers prefer or categories of stores they are most likely to visit. The below consumers were seen at the following locations within a six hour period before they reached Target, Walmart and Macy’s. Your campaign is only as good as the results it yields. Measure your effectiveness during the campaign to optimize and get the best value from your media budget this holiday season. You can use deterministic footfall data in your programmatic platform to see how your line items are performing in real time. How is your in-store visit data derived? How do you validate the user location data used to determine a visit occurred? What is the source of your places data? Is it licensed? How do you attribute a mobile device user to a place? How precisely can I define my list of “conversion” locations? Can I measure visits to places other than my own locations? Can you measure my entire media buy across all vendors and channels? Be sure to use the results from your holiday efforts to help plan your 2018 campaigns. No matter your goals, the Factual team is here to help you. Download our Holiday Strategy Guide or reach out to a location data expert today at strategy@factual.com.